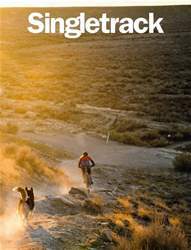 Digital Subscriptions > Singletrack > 124 > RACKPACKING! Antony de Heveningham looks at three unconventional mountain bikes that come with fitted racks and a sense of adventure. Not so long ago, many mountain bikes were designed so their riders could carry stuff on racks. Just bolt one to the back of your hardtail, add some panniers and you could disappear off on an adventure. Probably to a youth hostel, or a sixth form college, but an adventure nonetheless. At some point though, bike manufacturers decided that this rather lukewarm strain of excitement wasn’t doing it for their target market, and racks started to disappear. The advent of suspension and disc brakes didn’t help, as neither of them played well with racks. But, more than that, racks and bags fell victim to an image problem. Mountain bikes were fast, adrenaline-fuelled and youthful, and encumbering them with luggage was viewed in the same light as mounting a roof box on a Porsche 911.